I must confess, I’m a bit of a design snob when it comes to locations in Second Life. With the emergence of mesh there’s just no need to use textures from 2007 anymore, no, they simply won’t do. I want to see imaginative, beautifully created locations that make me want to explore further. I want to see design innovation, and I want to be energised by my space. I want the deco and styling to suit the area, and I want it to have meaning. Ok, you see my point, I have a lot of desires when it comes to ideal virtual hangouts, but a girl’s gotta have standards, right? With the wealth of mesh builds and fantastic structures so to my mind there’s just no excuses anymore for second rate venues. Sadly many places that sell themselves as bars and clubs do a shoddy job when it comes to decor. Don’t get me wrong, I understand that the whole;e point of a social gathering is the people you are with, but for me location plays a HUGE part too. If a place doesn’t look right, I’m not going to stay longer than five minutes, and if I see anything with bling or dreaded hoverscripts left, right and centre then I’m out of there faster than you can set a greeter on me. Woe betide my being bombarded with LM’s and notecards as soon as I land at a place..that’s a definite no-no; it just won’t do; I want QUALITY establishments, and unfortunately they aren’t easy to find. Tonight is a good example; for the first time in a long while I’ve felt the need to connect socially in-world with other avatars. In fact, I’m open to make new connections, so I decided to see what locations were out there. 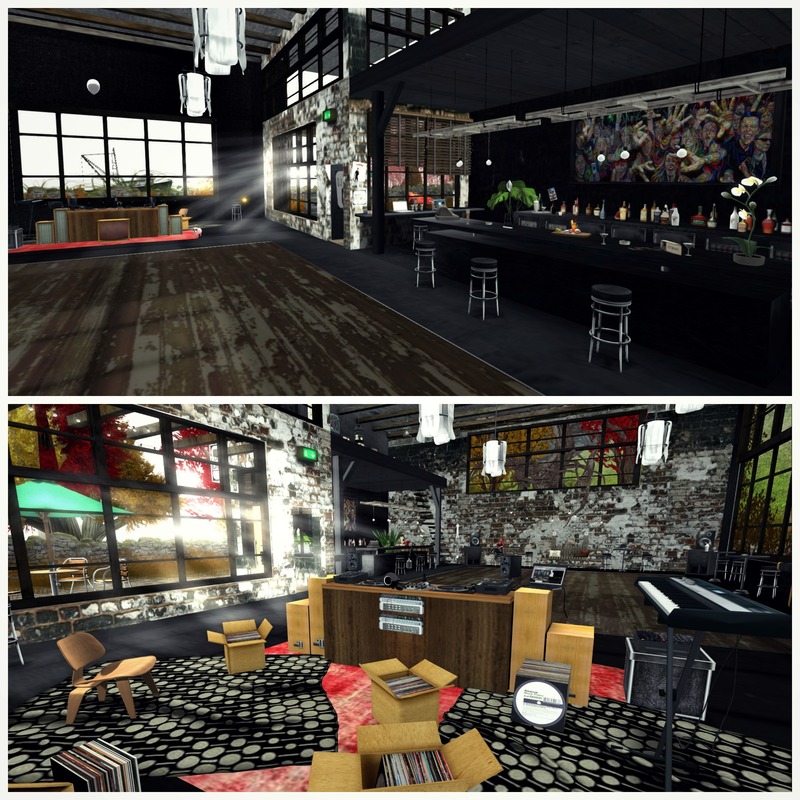 I used to spend a LOT of time at bars like ‘The Crown And Pearl’, and ‘Nu Republik’, and of course ‘Three Lions’ was my first true hangout in the metaverse, but I’ve never really found one that has come close to these in terms of patrons or ambiance. So I took to Plurk to ask my Plurk friends to see if they could come up with any suggestions, and I also dared to try out the Destinations Guide. I have to say that the Destinations Guide is sore in need of an update. I went straight to the ‘Bars & Pubs’ section and decided to run through them all in turn. Most venues were sadly empty (timezones be damned) but a lot of them just didn’t have the ‘look’ that I was hoping to find. A few weren’t even bars or clubs anymore, two were residences and one of them was now a ‘Gentleman’s Club’! This is Bar Deco, and as soon as I saw it I knew it was the kind of place I would love to enjoy a drink and a dance or two. It’s quite small, perhaps it’s better to say ‘bijou’, and even though it was empty when I visited I was struck by the character of the space. It really looks the part, ample amounts of mesh objects and textures deployed to give a lived-in yet funky feel. There’s a small sun terrace next to the entrance, which leads straight into the dance-floor area. I really liked the DJ area, instead of a hi-tech glass and chrome cabin as favoured by many locations, this is an open space filled with wooden units adorned in decks and festooned with records. There’s an old-skool arcade machine, along with an area to sit and surf the interwebs. An open staircase leads up towards a single deck area decorated with a large comfy sofa and contemporary prints. Towards the rear there’s an outdoor chill-out area, and the whole building gazes out onto a distant fishing boat as it sails the Second Life sea. The whole place is perfect but there’s just one problem..there’s nobody here!!! But one thing did fill me with hope, and also proved that this establishment has been set-up a little more professionally than others; there are links in the club to both a Facebook page AND a Soundcloud page so you can listen to some of the sets that have been performed by DJ’s at the venue. I’ve added a LM to my inventory, and I really hope to be able to visit and dance with some regulars very soon because I really like the place. Until then, well the dancefloor was empty, and it would have been a shame to waste it…. 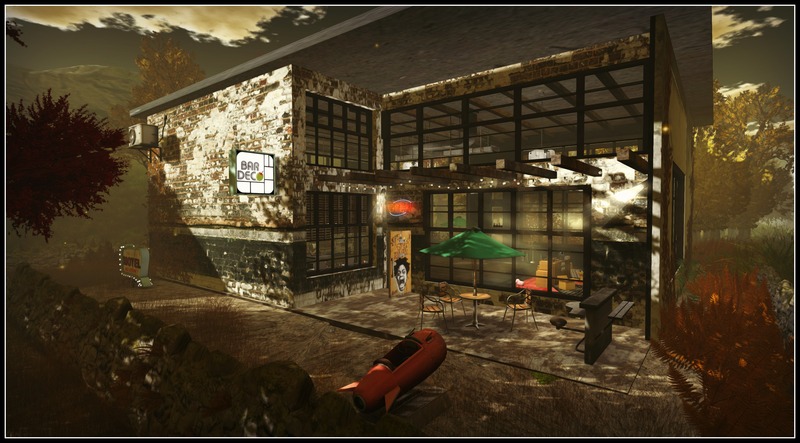 Over to you dear readers; tell me about your favourite pub/club/hangout in Second Life and post a link in the comments below so that I can check it out!